Among Uber’s many troubles, passenger safety has been a persistent concern. 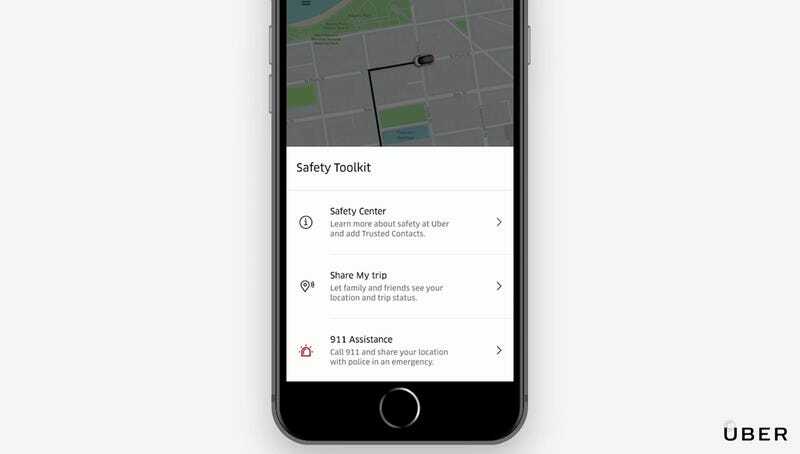 In a new effort to curb sexual assault and other forms of violence perpetrated by drivers, Uber is adding new safety features to every U.S. rider’s app, including an “emergency button” that will call 911. In a few test cities, the button will even share your location directly with a 911 dispatcher. The emergency button is located in a new “safety center” menu that is easily accessible from the app’s home screen, giving riders a quick way to contact first responders in the event that something goes wrong during their trip. The safety center also includes information about the driving screening process, insurance protections, and community guidelines (aka the list of horrible behavior that will get you banned from Uber). To dial 911, riders will need to swipe up on the safety center icon, and then tap “911 assistance.” They will then be asked to confirm they mean to dial 911 before the call is put through to emergency dispatchers. At first, the panic button might appear to be no more useful than Apple’s emergency button or just dialing 911, but there are a couple of factors to keep in mind. In an emergency situation, a rider could easily look in the Uber app for a way to contact the company in a panic without first thinking to just call the police. But the biggest benefit is that Uber is aiming to make it possible for you to share your location automatically with a 911 operator. The days of landlines trained us to believe that 911 could easily track down your location but in the age of the smartphone, it’s actually trickier than it sounds. USA Today recently covered the hurdles dispatchers face when it comes to pinpointing the location of a caller. Depending on where a caller is in the U.S., the success rate for quickly locating the phone that’s calling can be as low as 10 percent. Between 2011 and 2013, Silicon Valley’s emergency dispatch was effective at finding a precise location 10-37 percent depending on the wireless carrier. In March, the FCC set new rules that will require wireless carriers to be able to deliver accurate location data to dispatchers 80 percent of the time by 2021. At the moment, if a carrier can’t quickly locate the device, nearby cell towers are pinged and the caller’s location is vaguely estimated. Google has been working to test its own service for delivering location data to emergency call centers and its tests were able to estimate radii of around 121 feet. That’s significantly better than the estimated average of 522 feet. Unfortunately, automatically informing dispatchers of your location is only being tested in a few markets at the moment: Denver, Colorado; Charleston, South Carolina; Chattanooga and the Tri-Cities, Tennessee; Naples, Florida; and Louisville, Kentucky; with it coming soon to Nashville, Tennessee. Uber’s Director of Product Management, Sachin Kansal, told TechCrunch that the cities were determined based on “how fast some of them were able to move in terms of training agents and testing functionality.” The goal is to eventually implement the feature in every Uber market. TechCrunch reports that drivers, whose safety issues get less attention but are still quite serious, will also get a panic button soon. And an international expansion of the safety center is expected to begin this summer. As far as building back its reputation and being seen as a force for good, Uber could lead the way in setting up a better location tracking infrastructure for 911. It’s easy to imagine the company offering an emergency option even if you aren’t in the middle of a ride at the time.